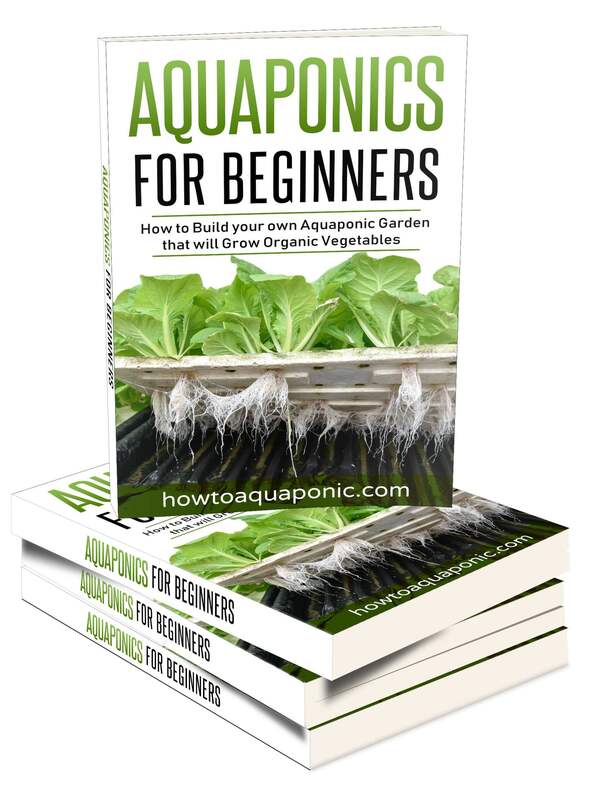 Aquaponics and Microgreens – A good mix? 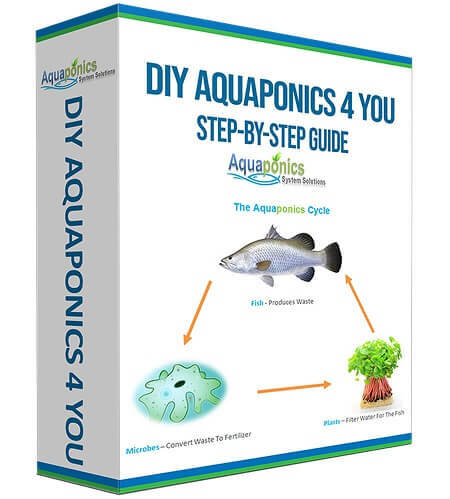 Once you realize that you can create a complete biological micro-system which is almost completely self-sustaining and just requires fish and plants; you’ll quickly want to know which is the best system to adopt for aquaponics microgreens. 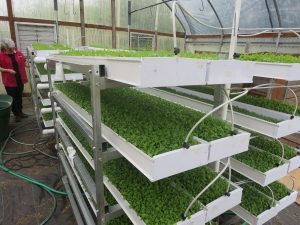 There are many different options but choosing microgreens aquaponics is a viable and interesting option as an introduction to aquaponics or if you have plenty of experience. This guide will help you to understand what you need to successfully create this system and keep it running. Microgreens are simply vegetables which are harvested shortly after the shoots have sprouted. In effect, they are tiny green vegetables, smaller than baby greens, which you’ve probably already heard of. The real advantage of microgreens aquaponics is not that you can choose when to harvest in order to maximize their flavor; sweet or sour. It is actually the fact that you can be growing microgreens in an aquaponics system from seed to harvest in as little as 7 to 14 days! Even a small microgreens aquaponics system can offer a significant return and provide you with healthy vegetables throughout the year. 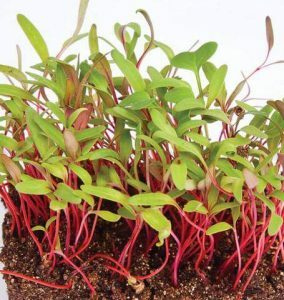 There is an array of different vegetables that can be called microgreens; these are some of the most common and the best ones to start your microgreens aquaponics system with. Alfalfa I said to be full of vitamins A, C, and K which help to nourish your skin; keeping it feeling and looking young. They also boost the secretion of enzymes, which are essential to boost your energy and prevent sagging skin; in effect, they can be said to help reduce the effects of aging. They can even reduce the risk of sometimes of cancer and lower cholesterol levels. It is definitely one of the best microgreens you can grow. Clover is very tender with a mild flavor and looks a little like watercress. It is said to boost your immune system and help you to detoxify. In addition, research suggests clover microgreens can balance the alkalinity level of your body. Collard microgreens have the same flavor as adult collards but are more intense; they are also a similar color. Surprisingly not much research has been completed on the health benefits of this particular microgreen. But, it is believed to help protect your body from various cancers. This microgreen is pale green and the flavor is similar to full-grown red lettuce. This makes it a great addition to any salad or as a garnish. Kale is also very high in lutein which is known to protect your eyes and skin. In fact, research suggests that consuming lutein can decrease your chances of macular degeneration. If you like cabbage then this is the right microgreen for you. It has a mild cabbage flavor although it also looks a little like watercress; with white stems and pale green leaves. Kohlrabi is known to improve your digestion, improve energy levels, and regulate your blood pressure. That makes it a new favorite. These have the same delightful flavor and heat of a full grown radish but are an excellent addition to any salad or even a burger. Interestingly, they have very high levels of vitamin E, vitamin C, and vitamin K; all of which help with skin and heart health; as well as boosting your immune system. The pretty red stems with dark green leaves are instantly recognizable as Swiss chard. The flavor is similar to adult spinach and you’ll also find this is high in lutein; protecting your eyes and skin. 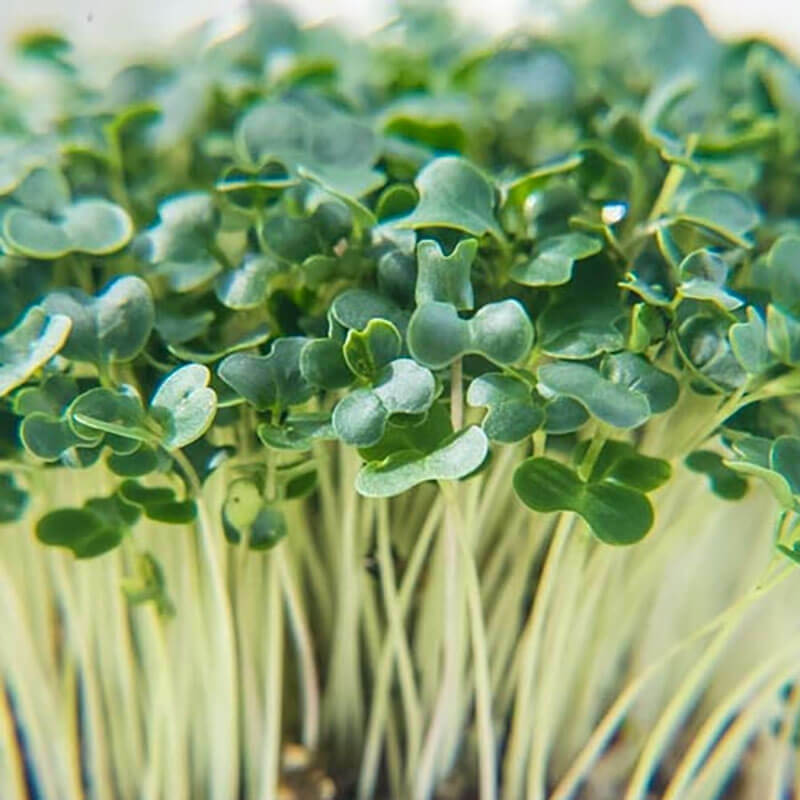 If you use your microgreens aquaponics system to grow a mixture of broccoli, clover, and radish then you’ll get all the benefits associated with each of the microgreens above and an array of flavors that will make any dish taste delicious. Click here to check out the mix. It’s worth noting that the radish in this mix will add a little spice to the flavor. This is the perfect mix for boosting your immune system and even making you look and feel younger. Again, mixing the microgreens will enable you to blend the flavors and add more texture to your meal. The mix grows in identical conditions to growing them individually, making it something that you can easily achieve. The antioxidants in this mix will help to protect your heart while reducing the chance of contracting an array of age-related diseases. The downside of growing such young and small plants is that the smallest shift in temperature or pH, outside of their normal range, can kill them or slow down growth. That’s why it’s important to monitor the pH and other nutrients on a daily basis. Like most plants, for the seeds to successfully germinate you’ll need to have an air and water temperature in the region of 70°F-75°F. Keeping the seeds moist is not an issue in an aquaponics system but you do need to make sure the pH is as neutral as possible. 7 is ideal, but you can get away with anything between 6.5 and 7.5. Remember, even a small shift in the environment can have a huge negative impact on these delicate plants. Due to the small nature of these plants and the fast turnover time, there are two main options for growing them. The main principle is that you need a large, flat surface. This will allow all the seeds to grow the few inches that they need to before you harvest and enjoy them. Don’t forget that the density of these seeds is 1.5oz seeds per tray, depending on the microgreen. Each tray should be approximately 10” x 20”. That’s a lot of seeds on one tray. Grow beds are perfect for creating a large surface. However, it doesn’t matter which media you use you’ll find that the seeds become scattered. In short, you won’t be able to get them as dense as you would like because the seeds will end up in all the nooks and crannies. To deal with this issue you can use a hemp grow mat on top of the grow bed. This will provide a flat surface, especially if your grow bed is a tray. The hemp grow mat will be approximately an inch deep and absorb the water, through the tray. This will keep your microgreens moist, allowing them to grow. The alternative is to use a floating raft system, this keeps the seeds separate from the water but with instant access when they need it. 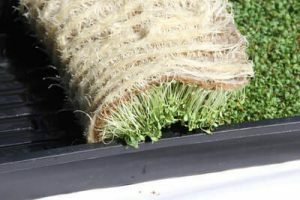 The best idea for your microgreens aquaponics system is to use netting pots lined with the hemp grow mat mentioned above. The netting pots will allow the water to flow around the roots while the grow mat will prevent the seeds from being flooded. The bottom of the pots should be just touching the water to ensure they always stay moist. Speed: a crop can be ready in just 2 weeks. 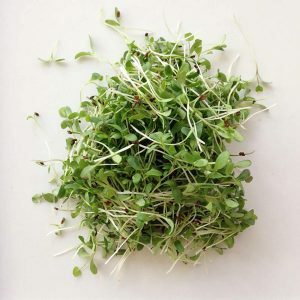 Microgreens are very nutritious and offer an array of health benefits. Minimal space required can be kept on a shelf in your home with enough light. Very Easy system to start and losses minimal if you get it wrong. Time-consuming as you’ll have to replant every two weeks. Excess vegetables that you don’t know what to do with. 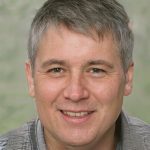 Vulnerability to small changes in the environment. Will support very few fish as the plants are so small they are not consuming large amounts of nutrients. One of the greatest things about microgreens aquaponics is the density level. You can pack 1.5oz seeds per tray. Each tray should be approximately 10” x 20”. That’s a lot of seeds on one tray. Here are a few of the most commonly asked questions. If you don’t find what you need to know here then contact me, and don’t forget to subscribe to my feed. Can you grow them with other plants? Yes, but you’ll want to set up a separate growing area and connect this to the rest of the system. This is actually a good idea to help keep the pH and other levels under control while the microgreens are growing for such a short period of time. What are the best fish to use? The good news is that microgreens can be grown with virtually any fish that like warmer water. Tilapia is a good starting point but you can also use perch, largemouth bass, Koi, and goldfish. Where do I buy the seeds? You can purchase microgreens in seed form from your local store but you’ll probably find it easier and more cost effective to order them online. A microgreens aquaponics system is so easy to set up and reap rewards from that it should be the first system you try; it will inspire you to do more.